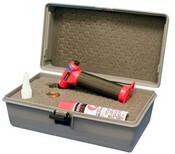 The Fuma-Gun Cyanoacrylate Fuming System is the most versatile fuming wand available. It’s similar to traditional fuming wands in that it is butane fueled and auto-igniting; however, that’s where the similarities end. The Fuma-Gun incorporates a rechargeable cyanoacrylate cartridge which eliminates the need to purchase expensive one-use-only cartridges. At less than 25 cents per charge, the Fuma-Gun is extremely cost effective for your department. It also provides users with the industry’s first ergonomically correct pistol grip handle. This same handle also acts as a base for the Fuma-Gun, which makes this the only free-standing fuming wand on the market. The Fuma-Gun is perfect at crime scenes or in the lab. Its free-standing design allows for hands-free use when used in conjunction with a fuming chamber. The Fuma-Gun Cyanoacrylate Fuming System includes the Fuma-Gun, one 1 oz. bottle of Liquid Cyanoacrylate, and one canister of Butane Fuel, and it is available with or without a sturdy carrying case. ​Just as with the Fuma-Dome™, recharging the Fuma-Gun cartridge is quick and easy. Simply squeeze a few drops of liquid cyanoacrylate onto the porous steel ball located between the two bronze retaining screens, wait a few minutes, and your Fuma-Gun will be ready to use. A recharged cartridge will provide you with approximately three to four minutes of fuming. To develop latent prints with this new fuming gun, squeeze the trigger to release and ignite the butane fuel. Place the Fuma-Gun where you expect to find prints and, within a few seconds, prints will begin to develop.